A Sudanese woman carries a bag of food-aid on her head at the El-Riyadh camp for internally displaced persons (IDP) in Geneina, the capital of Sudan’s West Darfur state, on 8 February 2017. Rights groups are calling for “a new set of “smart and modernised” sanctions that would “spare” the Sudanese people. The US has extended its sanctions against Sudan for another three months, saying “more time is needed” to review whether Sudan has done enough to merit their removal. Sudan’s President, Omar Bashir, responded by suspending his negotiating committee until the end of the three months. The committee has been in negotiations with US officials for more than a year, as it seeks to put an end to an American trade embargo put in place in 1997 over concerns relating to human rights violations and the state-sponsored terrorism. US President Donald Trump said “the Government of Sudan has made some progress” but that the extra three months would allow the US “to establish that the Government of Sudan has demonstrated sufficient positive action” in the areas of achieving sustainable peace in Sudan, removing remaining obstructions to the delivery of humanitarian assistance, bolstering cooperation to counter terrorism and promote regional stability. Sudanese Foreign Minister Ibrahim Ghandour has voiced Khartoum’s disappointment about the US decision to extend the sanctions for another three months. The Washington-based think tank Enough Project was quoted by Al-Monitor as saying that the Trump administration should now devise a new set of “smart and modernised” sanctions that would spare the Sudanese people. The sanctions “should target those who are most responsible for grand corruption and atrocities, including air strikes on villages, attacks on churches, obstruction of humanitarian aid, jailing and torturing opposition figures and civil society leaders, stealing elections, and undermining peace efforts”, it said. During a press briefing in Washington yesterday (12 July), State Department officials said the US would continue to engage with Khartoum also “on other vital issues”, including “dialogue on improving Sudan’s human rights and religious freedom record, and also to ensure that, like we are on track with that throughout the globe, committed to the full implementation of UN Security Council resolutions on North Korea”. The US is increasingly concerned about North Korea’s growing military threat and the financing thereof and said it wants to ensure Sudan’s “full commitment” to those resolutions. Sudan has been on the US State Department’s list of State Sponsors of Terrorism since 1993 and, according to a UN report that was published in March this year, North Korea supplied Sudan in 2013 with sophisticated air-to-ground missiles that use satellite guidance systems. The move was criticised by human rights groups, which called it “premature” and “despicable” as Sudan’s President is still wanted by the International Criminal Court for crimes including “genocide”. A bipartisan group including 53 US lawmakers earlier this week urged President Trump to delay the lifting of sanctions. In their letter, they mentioned the “demolition of two Christian churches in Khartoum this year” and the Sudan government’s plan to bulldoze at least 27 more, describing it as “state-sanctioned persecution of Christians and the denial of freedom of religion”. The letter echoed the appeal of seven US-based organisations last month to US Secretary of State Rex Tillerson, asking him to take into account the situation of ethnic and religious minorities in Sudan. 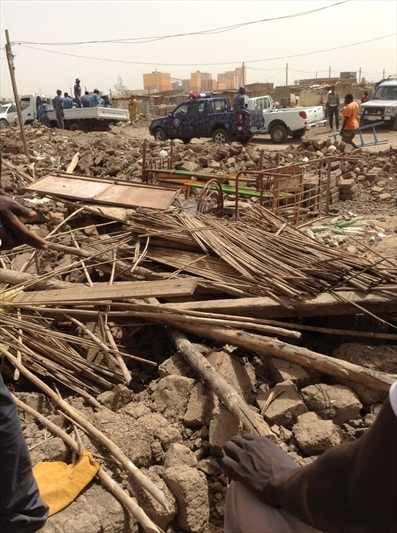 World Watch Monitor has reported on the destruction of several churches in and around Khartoum, and the situation of the people of the Nuba Mountains, who have been the subject of “ethnic cleansing”, according to Christian charity Open Doors. World Watch Monitor also recently spoke to Mariam Ibrahim, three years after she was freed from prison after narrowly escaping being hanged for “apostasy”, first having been lashed 100 times for “adultery”. At the same time, in response to concerns raised over its human rights record by the US embassy in Khartoum, Sudan last week insistedthat the country “enjoys religious freedom” and “unprecedented openness”. Sudan is one of six countries whose citizen are subject to the new “travel ban“ imposed by President Trump. The country is No. 5 on the Open Doors 2017 World Watch List of the 50 countries in which it is most difficult to be a Christian, and is also a “country of particular concern” for USCIRF. Foreign Policy reported last month that the Sudanese government had hired a prominent Washington-based law and lobbying firm, Squire Patton Boggs, for $40,000 a month to help remove the sanctions. Meanwhile, President Bashir recently announced that he will visit Russia in August, a move that could be interpreted as a message to the US that Sudan has other options if the sanctions were not to be lifted.